The all new TFV8 X Baby Sub Ohm Tank features 4ml capacity for the standard US version and 2ml for the TPD complaint EU version. The TFV8 X Baby Sub Ohm Tank also introduces the new X Baby Coils which were designed to handle juice pressure better and provide seamless wicking that cools off your coils wires and keeps the cotton nice and juicy so the overall flavor and cloud experience remains intact longer than other coils created by Smok. 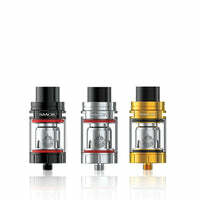 TFV8 X Baby Sub Ohm Tank - Smok has a rating of 4.1 stars based on 13 reviews.